On this site I try and cover some of the top NLEs (Non-Linear Editors or video editing applications) Colour Grading applications and Visual Effects packages around. But there’s one package I don’t cover which I think may interest quite a lot of people and that’s HitFilm ( www.hitfilm.com ), a product with both a free and paid-for version – but even the paid-for version is affordable! 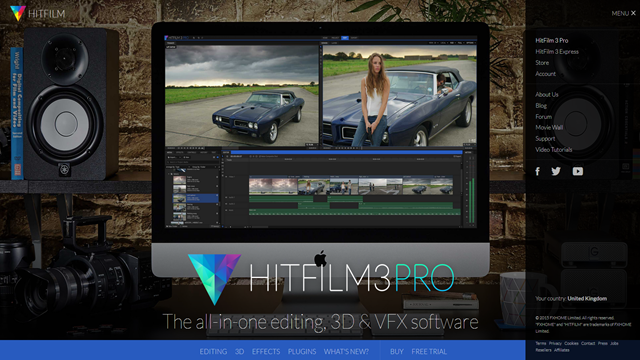 So why do I want to put a short-out for HitFilm when there are the likes of Premiere Pro, After Effects, DaVinci Resolve and Fusion out in the market? Well, while I really love those products and find them great to use, there are a large number of people for whom these products simply don’t fit. Let me give you an example. I speak to a people who have older versions of PP and AE – (even back to CS5) who simply can’t afford the £50 a month or £600 a year it costs to have the latest versions of PP and AE. The end result is that they feel restricted, stuck with old technology and a little hard done by Adobe who have put the products they love out of reach for upgrades. Then on the other hand, there are the wonderful DaVinci Resolve and Fusion (free and paid versions). However, unless you have a background in node based editing/compositing AND (particularly in the case of Resolve) – a good high spec machine with a powerful graphics card – you may struggle. Do I think it’s worth taking the time and effort to learn Fusion anyway – of course – but it’s not for everyone and especially those who are more use to a layer based VFX work-flow. This is where HitFilm really comes into its own. It is a powerful video editor (NLE) AND it’s also a powerful visual effects compositing tool – all in one! It’s kind of like PP and AE all in one – but at the same time it’s not PP and AE but its own unique product – in some ways stronger than PP/AE and in other ways not – but still much better than sticking with the older versions of those Adobe products. 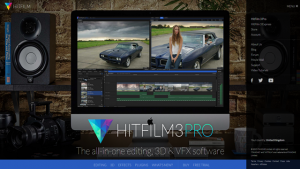 And the price for the full version of HitFilm which includes the video editor, visual effects compositor, plug-ins (see below) and Mocha for HitFilm? Well, in the UK it’s £233.37 as I look at the site today. And for that price you get the Video Editor and Visual Effects package – an amazingly good 3D workspace (for those who are into that kind of thing) – easy to use and powerful effects and presets to use with your work (fully customisable and animatable), Mocha for HitFilm, a whole set of plug-in effects that work with lots of other products – for example, I have these HitFilm effects in Premiere Pro, After Effects, Vegas Pro and DaVInci Resolve – and I suspect they’ll work with many others as well etc, etc, … All this and HitFilm work on PC & Mac and has all the training videos you need to get really good! One last thing – if you happen to own Sony Vegas Pro, HitFilm also works in a direct link type of way so that you can get your HitFilm composition working inside Vegas Pro and see updates automatically without the need to render out … powerful … (I did do a tutorial for that once – and it may appear on the Sony Vegas Pro section of the site in the coming weeks). So, this is why I think HitFilm is a product that a lot of people should be looking very seriously at. Firstly, it’s a really great alternative for enthusiasts who don’t want to spend large sums but who still want access to the latest technology AND the choice to upgrade when they want! Secondly, it’s a familiar work-flow for those who’ve used pretty much any other NLE- and especially for those who know something about compositing in After Effects (although if you never used this feature it would still be a great product). And finally, you don’t have to learn a whole new workflow as you may have to with Resolve and Fusion – all this and it works well even on ‘not-top-of-the-range’ computers! Now, as with all things it has its limits and at some point you may need to move on to another NLE/Colour/VFX package – but in the meantime, there’s no need to get stuck with old technology as HitFilm really does do a great job and is worth investing the money and time in – but don’t rush, try the free version and see if you agree. But if you do need to use Premiere Pro, After Effects, SpeedGrade, DaVinci Resolve, Fusion, Vegas Pro (and hopefully more in time) don’t forget to come back to www.tale2tell.com to access great free tutorials. Well – that’s my 2 pennies worth … but whatever you do – try and enjoy it – as it’s a privilege to be able to work in this field.